Rainbow bridge is one of the attractions near Page that is very highly searched for, but the number of actual visitors is quite low. This natural bridge, the largest known in the world, is breathtakingly beautiful but very difficult to get to. The most time efficient way is a scenic air tour. Because of the way Lake Powell is shaped, it is hard to get an appreciation of its size and scope unless you are above it. Check out this tour at 30 minutes, and 165$. 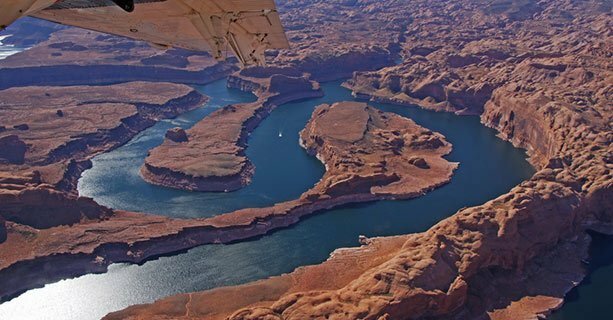 Aboard Lake Powell Rainbow Bridge, Grand Canyon Airplane Tours, guests are treated to aerial views of the bridge, one of the worlds largest natural stone arches. Additionally, the tour covers large swathes of Lake Powell. 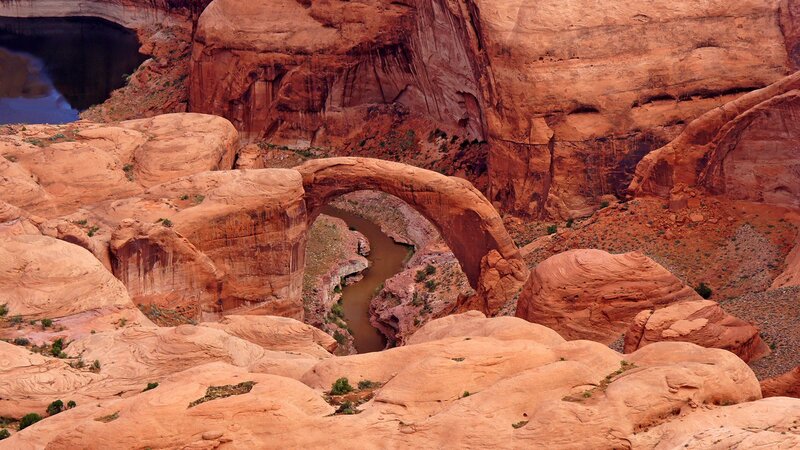 Formerly an impressive canyon before the construction of Glen Canyon Dam, Lake Powell, owing mainly to its many coves and sub canyons, sports more shoreline then the east coast of the USA. It provides recreation to thousands of people annually and help control flooding along the Colorado River. hi. is it still ok to go there for a tour even during these rainy seasons? Hi Lene and thank you for your excellent question! Since you posted on the Rainbow Bridge Air Tour page, I’m assuming that your inquiry pertains specifically to that activity. The Rainbow Bridge Air Tour runs mostly on a seasonal basis (spring, summer and fall) and weather permitting. So, if there is too much cloud cover, or winds are too strong, that will likely result in the delay or cancellation of the tour. If you are visiting Page in the winter months, you might still be able to take the tour as long as you have a minimum of 4 people flying, or if you are willing to pay out for the 4 seats with a smaller group. If you’re referring to Horseshoe Bend, it is open 24/7, 365 days a year, so you can go there no matter what the weather is doing, but take care during the wetter seasons as the trail near the overlook can be a bit slippery and it’s a long drop with no guardrails!